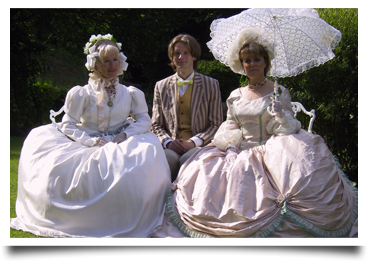 Hilary's Costume Room provides a choice of historical, themed and modern evening dress for groups, individuals, drama, operatic societies and event's organisers in and around the south Lakes area. All costumes come with accessories but small items of costume are also for hire. Customers include individuals, drama, operatic societies and event's organisers. In the unlikely event that we are unable to help you, I am sometimes in the position of being able to make a 'one-off' costume if enough notice is given. The unusual and the exotic are challenges we look forward too. On behalf of Borwick and Priest Hutton W.I Committee can i say a very big thank you for all your hard work making our fashion show a huge success. Everyone seemed to enjoy it, we certainly did with all your help and support.Once again thank you so much and hope to see you again before too long. Grange Youth Theatre and G,A.O.S youth Panto have been costumed by Hilary for nearly twenty years. The group has a membership of nearly 50 young people ranging from 7 to 18 years and Hilary has always provided excellent colourful costumes for all our shows. The costumes include chorus and principals; dames, prince and princess, giants, fairies, reindeer, ducks, horse and cow to name but a few. We are very very pleased with her new extensive catalogue (via the net) and will continue to use this splendid resource. My husband & I have used Hillary Stubbs for Fancy Dress for a few years, we have always found her so helpful and full of so many good ideas, her service is excellent and her choices fantastic, we can not recommend her enough. We also this last time had Hillary make some items for us, this again was first class and dealt with so quickly and professionally, we would truly recommend this bespoke side of her business too. There is a lot to be said also, for the way she greets you and deals with every detail, including accessories etc. We would certainly not go anywhere else.